This marks the second year animal welfare nonprofit American Humane has handed out K-9 Medal of Courage awards. WASHINGTON — The honorees at a Capitol Hill awards ceremony Wednesday stuck out their tongues and walked on all fours. They’re retired military dogs, after all. “Bottom line is, they saved the lives of our men and women in service, which I think is a tremendous reason to honor their service,” said Dr. Robin Ganzert, president and CEO of animal welfare nonprofit American Humane. This marks the second year the organization has handed out K-9 Medal of Courage awards. One of this year’s winners, a chocolate lab named Coffee, served 10 years in the military with just one handler: Army Sgt. 1st Class James Bennett. “Coffee’s purpose originally was IED defeat … so her job was to clear routes, buildings, paths, looking for explosives, anything that might injure troops. And beyond that, to find caches where they would hide stockpiles of them,” said Bennett. Coffee had three tours of duty with Bennett in Afghanistan. “Overall, her job was literally to lead units, be in front of units and get them from point A to point B safely, so they could effectively do their mission,” Bennett said. Another Medal of Courage winner, a black lab named Alphie, served two tours in Afghanistan, was shot at several times and nearly fell out of an aircraft that was under fire. Alphie retired from the military in 2014, but now sniffs out explosives at airports for the Transportation Security Administration. Capa, a German shepherd, was deployed to Iraq from Japan during Operation Iraqi Freedom. He’s credited with helping to protect the U.S. president and first lady, and thousands of military service members. Ranger, a black lab, served in Afghanistan and Iraq, where he helped sniff out roadside bombs. 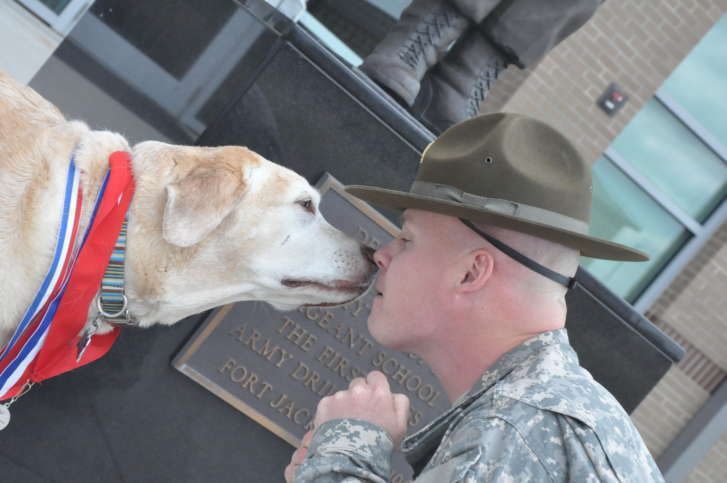 Ranger retired from the military in 2012 and was adopted by a retired police sergeant who says Ranger diligently checks every car that visits his home for explosives. Gabe, a yellow lab, died in 2013. He was a Specialized Search Dog for the U.S. Army from 2006 until 2009, completed more than 210 combat missions, and earned more than 40 awards and coins of excellence.